American Defense Secretary Leon Panetta at the weekend suggested that all of Israel's problems in the region can be traced back to its own behavior. 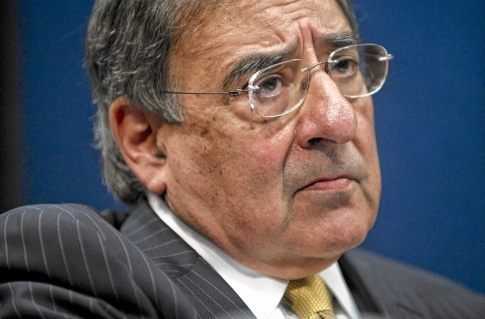 "Just get to the damn [negotiating] table," Panetta told Israel during a briefing at the Brookings Institute. Panetta insisted that Israel needs to be more flexible in order to "reach out and mend fences" with the Arabs, or risk facing even greater isolation. Panetta's outburst was typical of American foreign policy when it comes to Israel in that it completely ignored the dealings of the past several years. Panetta failed to recognize that it was Israeli Prime Minister Benjamin Netanyahu who had been waiting at the negotiating table all along, and publicly urging Palestinian leader Mahmoud Abbas to join him. For the past two years, Abbas has been explicitly refusing to negotiate with Israel until the Jewish state met preconditions that were never part of currently signed peace deals. Panetta's claim that Israel should make risky political gestures even if the Arabs are not sincere in order to unmask its enemies similarly displayed a very short-term memory. "If the gestures are rebuked, the world will see those rebukes for what they are, and Israel's moral standing will grow even higher," Panetta said, presumably in all seriousness. Of course, that is precisely what Israel was told before it uprooted 10,000 Jews from the Gaza Strip, before it handed over the ancient Jewish capital of Hebron and before it signed a peace agreement with terrorist mass-murderer Yasser Arafat. Ongoing anti-Israel terrorism and incitement following all of those gestures failed to win Israel any moral standing in the eyes of the international community. Continuing the emulation of his predecessors, Panetta finished by warning that Israel would increasingly find itself all alone if it did not heed his advice. "We have seen Israel's isolation from its traditional security partners in the region grow," said Panetta. It's almost as though each successive American administration does a foreign policy reset, and totally wipes its memory of anything that happened before it was elected. Otherwise, how could Panetta claim with a straight face that Israel has any "traditional" security partners in the region? Sure, Egypt and Jordan have for years been at peace with Israel, and even cooperated to some small degree in security matters. But neither is a "traditional" security partner. In fact, until just a few decades ago, Egypt was the country that most often went to war against Israel, with Jordan not far behind. While regrettable, a return to that situation would not be something new, and certainly would not be the result of any adjustment in Israel's behavior. Unfortunately, Panetta's failed attempt at reading the Israeli-Arab situation received far less coverage than it should after being overshadowed by another Obama Administration appointee blaming the Jews for Muslim anti-Semitism. Speaking at a conference of European Jewish leaders in Brussels on Wednesday, US Ambassador to Belgium Howard Gutman said there should be a distinction between traditional anti-Semitism and Muslim hatred for the Jews, as the latter is the direct (apparently legitimate) result of the ongoing Israeli conflict with the Palestinians. Gutman was taken to task by several of the speakers who followed him, and many American Jewish leaders called for his removal.